Wooden sash... throughout the 1970's and 80's we tore them off the house as quickly as we put carpet on the floors and fancy paneling on the walls, basically destroying the entire identity of the house in a few weeks work. I cannot begin to tell you how many people I have talked with who go through regular fits of self-annihilation thinking of the sash they've tossed out. You can always take up the carpet and refinish the floor or get rid of the paneling on the walls, but the sash that you threw out.... 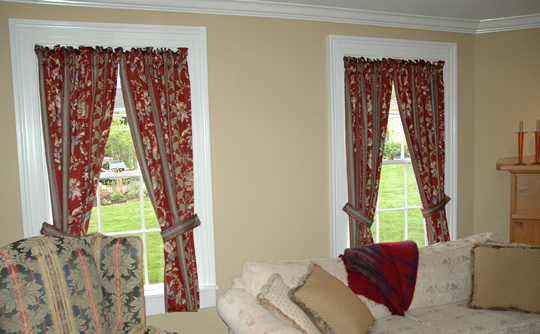 Wooden sash define your period home - if they are irreparable replace them with our sash. 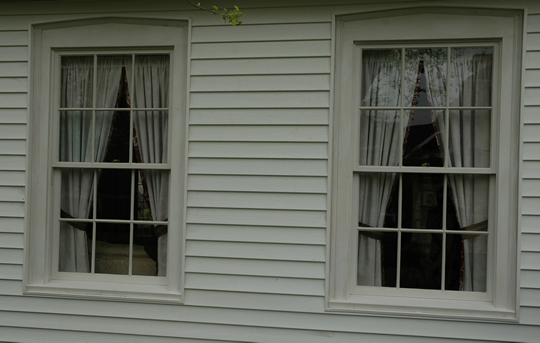 The little strips of tin or plastic that vinyl window manufacturers call 'grilles' are a poor substitute for real mullions found on truly divided lite sash. Putting vinyl on your old home will destroy its soul. Below you can view just a taste of the windows we create for owners and builders from coast to coast - these are high resolution photos that will take a long time to load - it will be worth the wait! 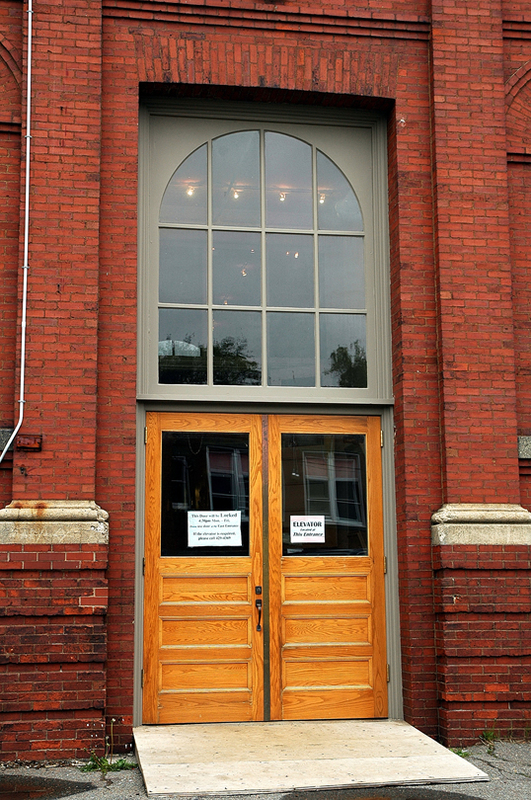 The above 4 images are three replica windows we built for the Yarmouth County Museum and Archives historic building. Their existing windows were the orignials and beyond repair. We constructed the new ones with prime, 2" thick African mahogany. 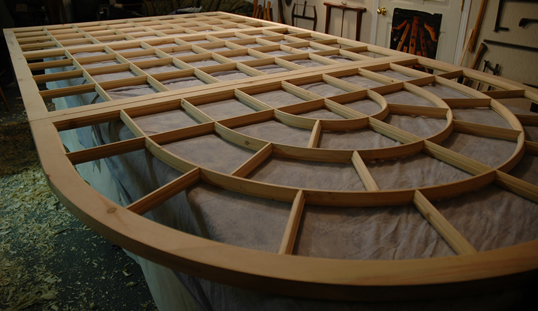 The center round-top window was 14' in height and represents the largest one-piece unit we've done to date. They all fit the 23" thick stone openings perfectly and this project was a complete sucess. Can you find the window we were hired to make a replica of here...? One of nine sets of casement windows we recently made. These are all true divided light windows. 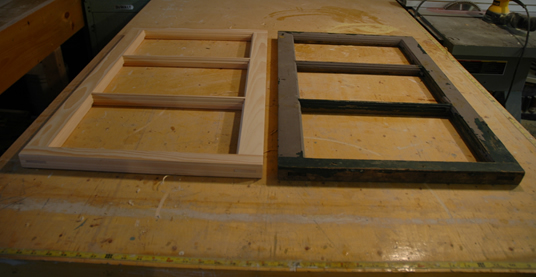 Hinged interior screens will allow access to the casement stays which will operate the windows. 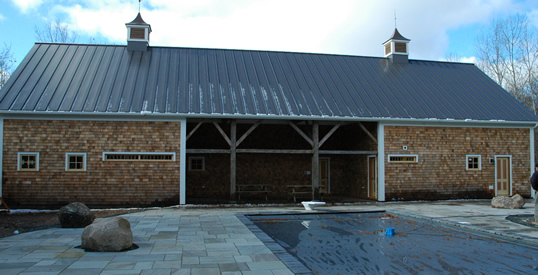 We built all the windows and doors for this barn. 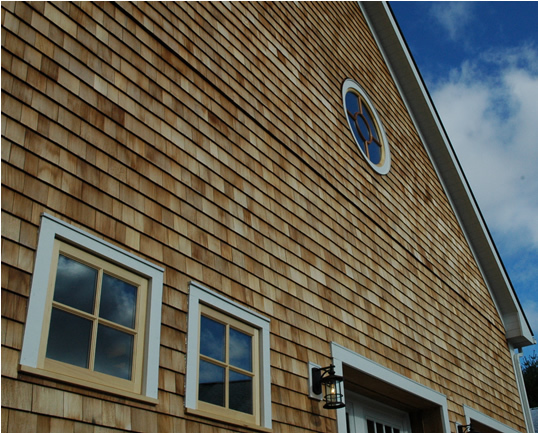 This is a new barn with a 150 + year reclaimed frame. 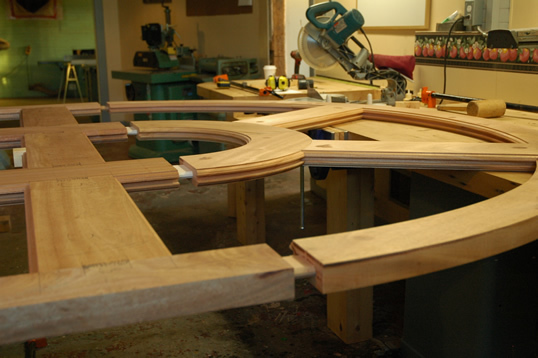 The barn sash we made for this are the longest we have ever seen or built. All the small square windows are operable wind-out casement windows with low-e argon thermal panes. 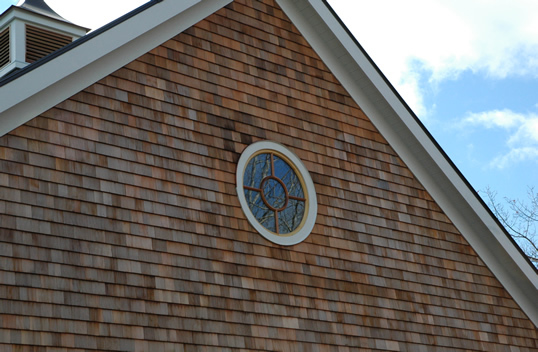 The two identical round windows at the north and south ends are simply killer and fit the project so well. This was a great project to be part of and I know the owner was completely thrilled. Thanks to all involved whom made it possible for us to be part of this. 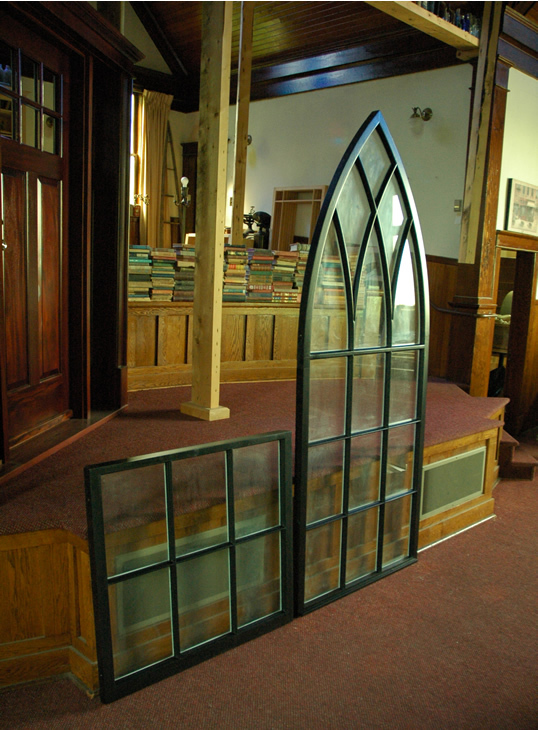 An exact reproduction of a 12 foot gothic church window that came to us complements of hurricane Earl. 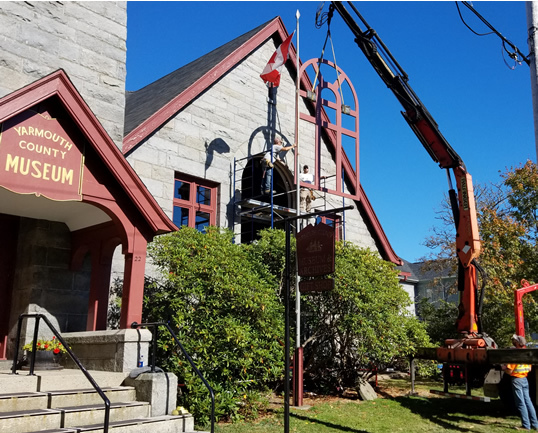 The difficulty with projects such as this is that not only does the replica have to fit into the existing jamb perfectly, the existing gothic shaped antique glass (that luckily was not broken in the storm) also has to fit perfectly. 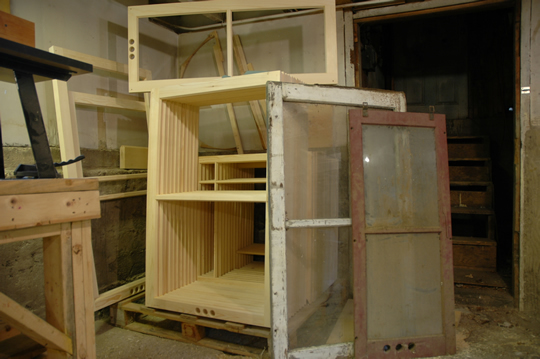 When one has to satisfy both internal and external dimension constraints things can get tricky... We however, at the Wooden Window and Door Company are reverse-engineering masters. 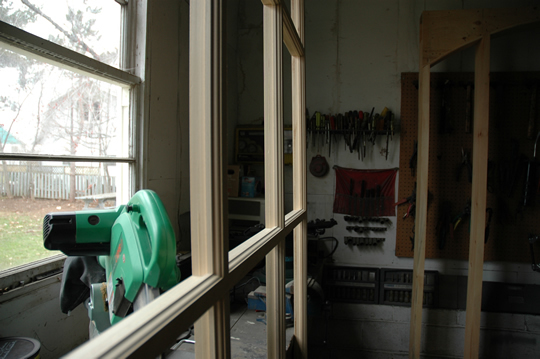 Here we have 3 large ''Great Room" windows currently being built. 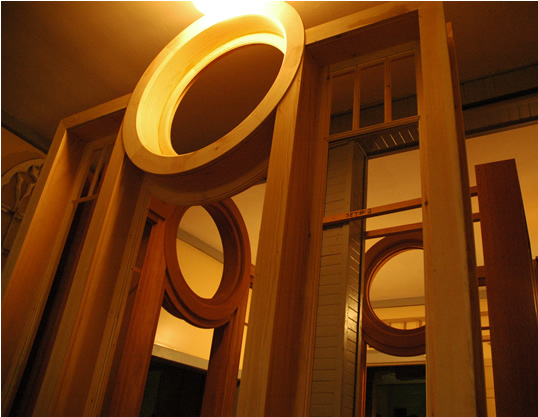 These windows belong to a group of architectural pieces we refer to as our 'Mathematical Quandary Series'. 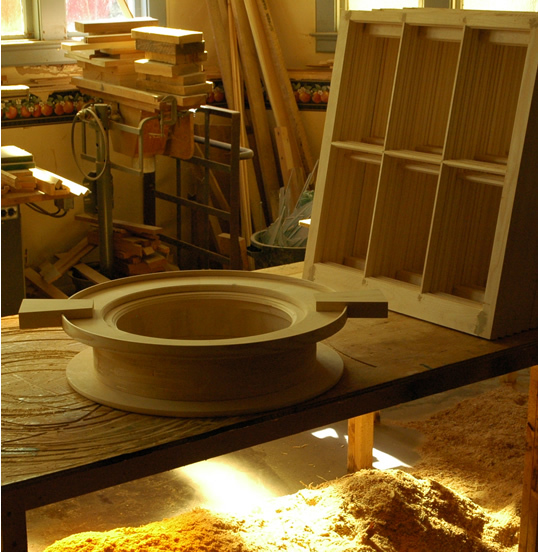 These mahogany and pine windows are getting art glass that will truly set these examples apart as world class windows. 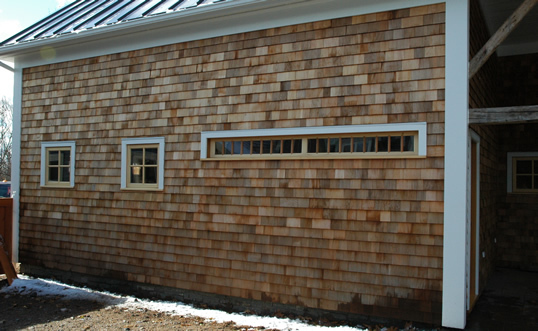 An operable mahogany, thermal pane window designed perfectly to fit the dormer of a carriage house. 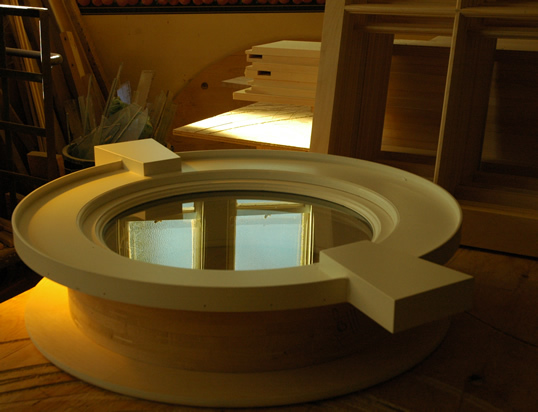 An attractive, large round window we are finishing up. A nice order of 12 lite sash ready for glazing. After being torn out, this window opening was covered up with plywood for many years. So nice to see it back. 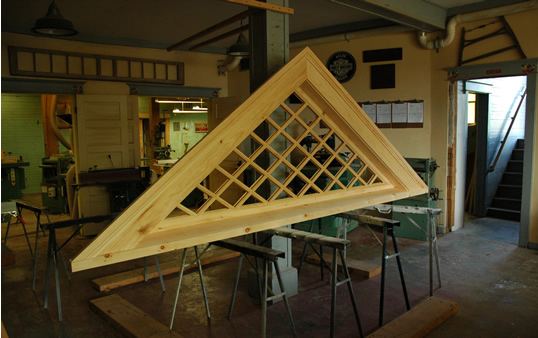 A grand, train station style window going to Halifax, NS. This large window has a width of over 6 feet and a total height of over 7 feet. 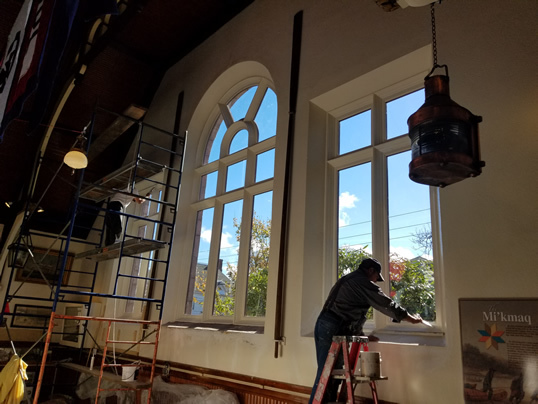 This window will be glazed with high quality restoration glass. The inside and outside views of a set of 9 over 9's ready to ship. Aren't heavily paned windows nice! 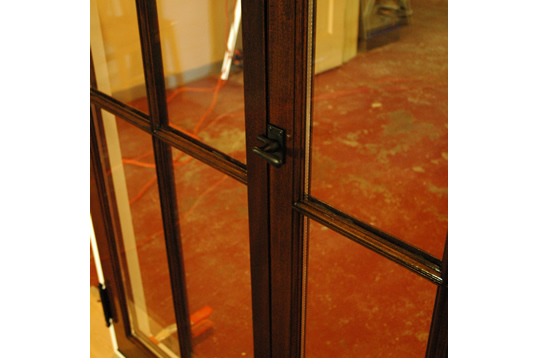 Like most of our work these windows come with spring bronze weather stripping, ornate sash locks and restoration glass. 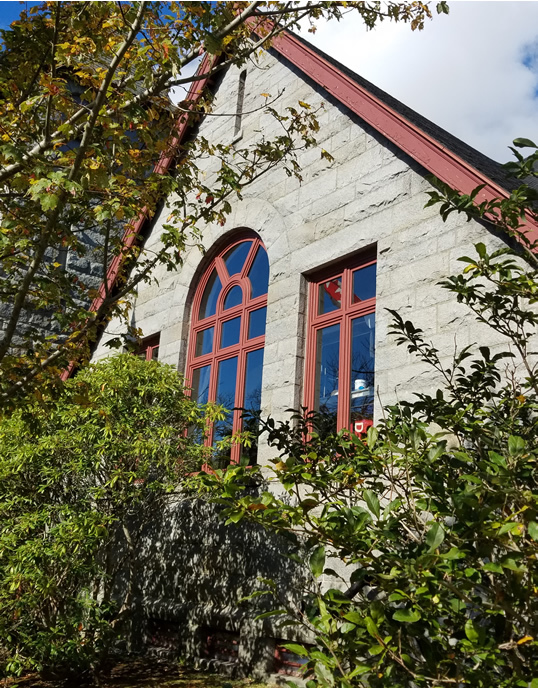 We have noticed in our study of old windows an interesting trend concearning sill slope - there seems to be a relationship between age and slope angle in that the older the building the higher degree of slope. We cut our sills at a high 18 degree angle using thick 2 inch stock. This combination seems to capture the old look the best. Here is a good shot of the meeting rail and sash lock. We have a large inventory of period hardware - not reproduction stuff, but the real thing. 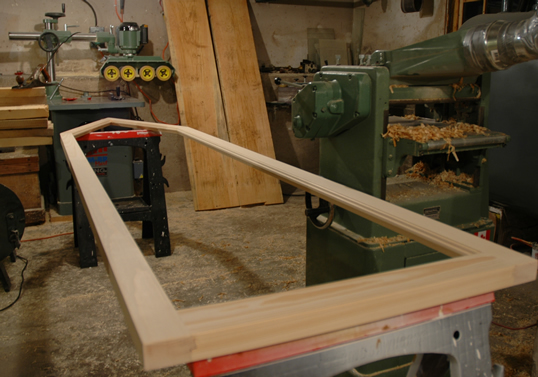 A big concern we get from potential customers is wood window draftiness - "...they just don't seal like factory built wooden windows...." This was an inital problem when we first started this company. How do you go about making a good seal without using cheap looking plastic or foam? The answer is spring bronze weather-stripping. Not only does this make a great seal, it looks fantastic, especially as it ages. Spring bronze also allows the sash to slide up and down with a cushion-like feel and there is no wood against wood contact. 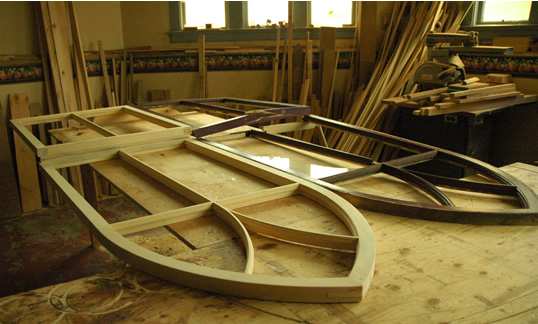 A nicely designed arched window we are currently building for the Maritime Conservatory of Performing Arts. A very long barn sash. This is the style you find above barn doors. 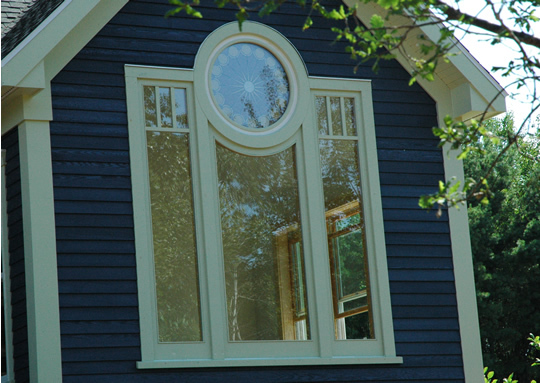 You should see how some folks are now using this style of window both on the interior and exterior. 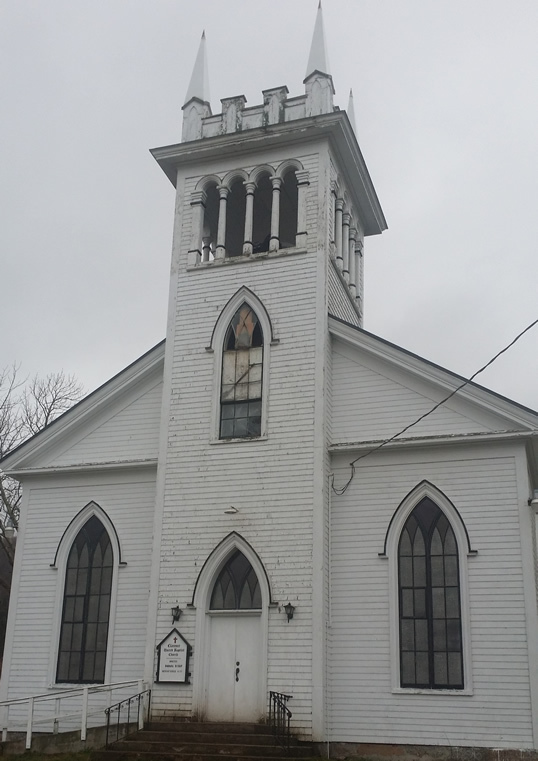 They are just stunning decorated with stained glass, old colored church glass and restoration glass. A very deep muntin profile. 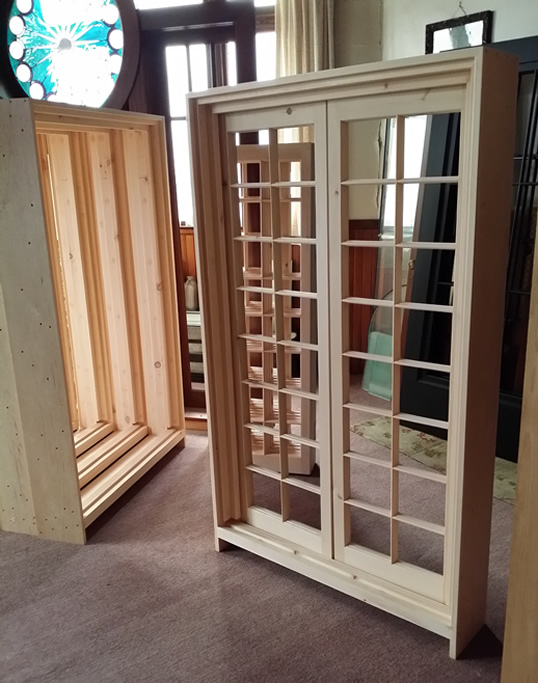 We are building these windows for a customer who, when describing what she was looking for would use words such as 'cute' or 'the window that you see in a children's storybook or the ones on a ginger-bread house...' These are definitely the quintessential window. 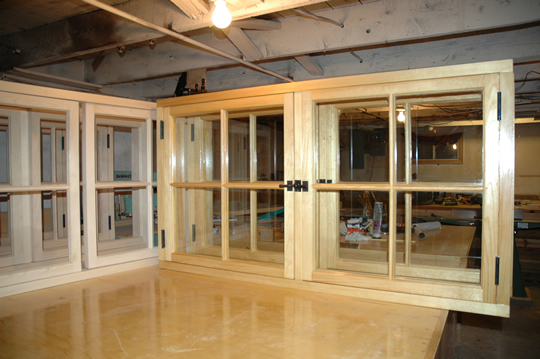 We build windows and doors that are reflections of our customers imaginations. 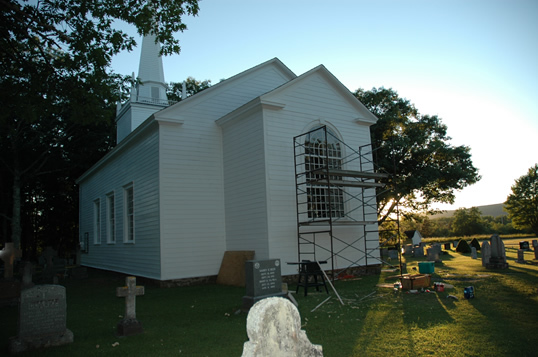 Here we are building a 92 lite window for what is considered to be one of the least altered Loyalist Anglican Churches remaining in Canada. 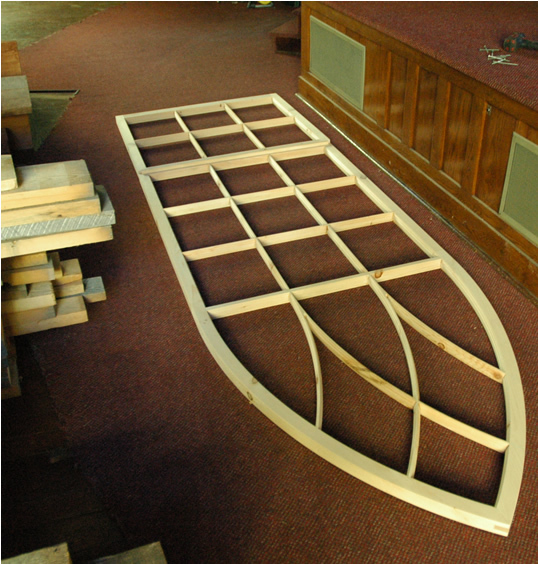 This is an exact replica of the main window in the Old Holy Trinity Church. 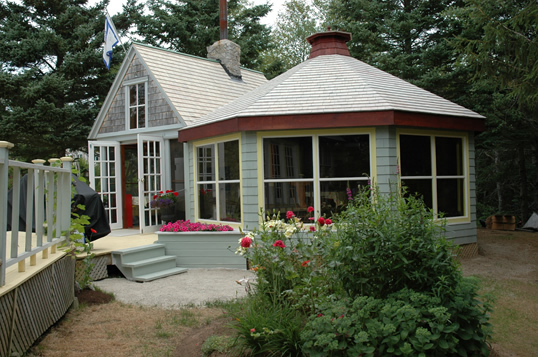 The difficult part of this project was that we needed to reuse all the glass of the original window. Two hundred year old glass was not cut equal in size due to lack of efficient glass cutting equipment. Making a window accommodate 92 separate panes of different size glass took many hours of thought that in the end yielded a complete success. 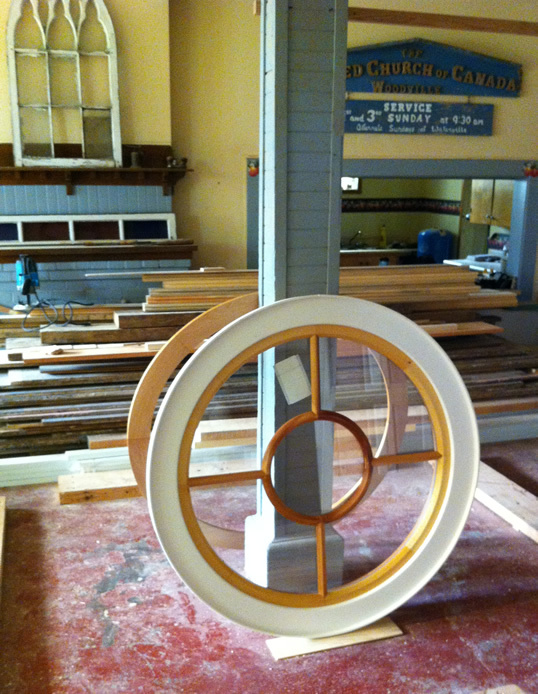 This window is now ready to illuminate the hall of this architectural treasure for another 200 years! Below you can see the window finished and being installed. 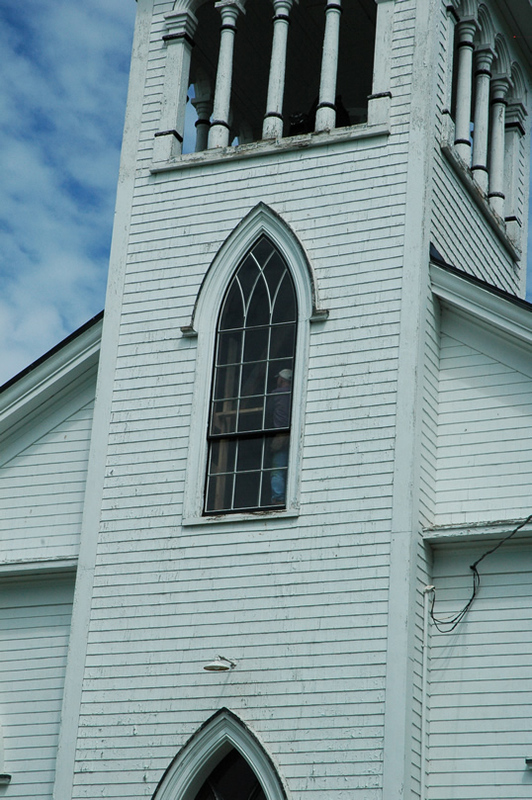 Another window for a old church in Wilmot. This straight peaked window is over 12 feet high. 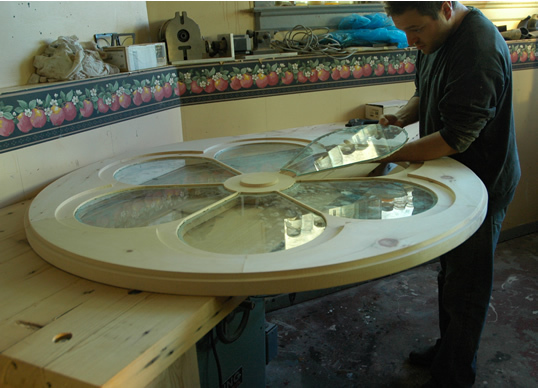 Once completed by us it will be shipped to a master stained glass artist and then finally installed. The window actually looks a little crooked in this photo but I can assure you it is deadly straight. Click here for some close-up images. 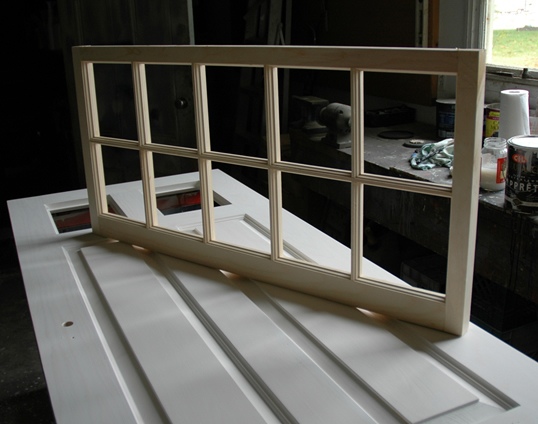 An attractive 10 lite window for a restored barn. This particular homeowner knew exactly what she was looking for and really got things finished off nicely - from both inside and out this renovation work was done right! 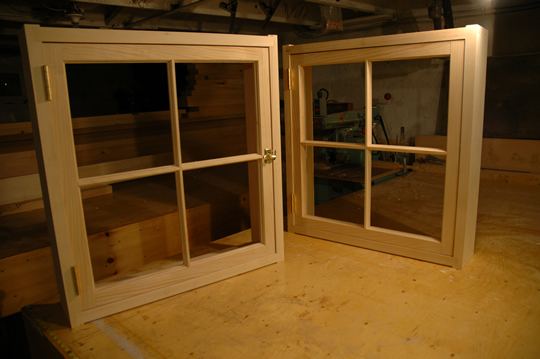 We get a lot of requests from the post and beam market for wooden windows. Vinyl simply does not fit the bill for log and post and beam homes. Owners are ecstatic when they receive windows from us and see the perfect joinery that is complementary to that of their home. We built this set of six casement units for a beautiful post and beam home located in the Berwick area. Quite often we get customers who simply want a single sash built. In this case an old basement window that was beyond repair needed an exact replacement. 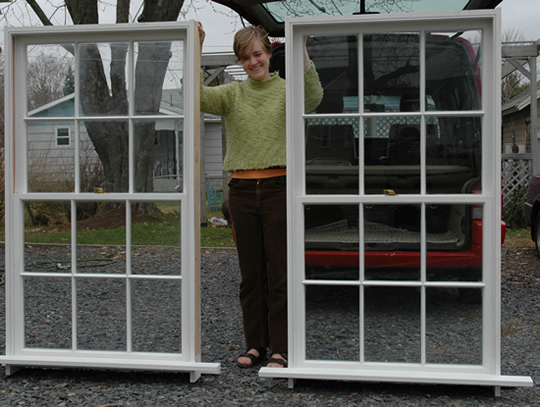 We occasionally build windows that accept insulated or double pane glass. Although the heritage market is our forté we understand the practicality of those who want modern glazing along with the beauty of true-divided lite windows. It makes a nice compromise. 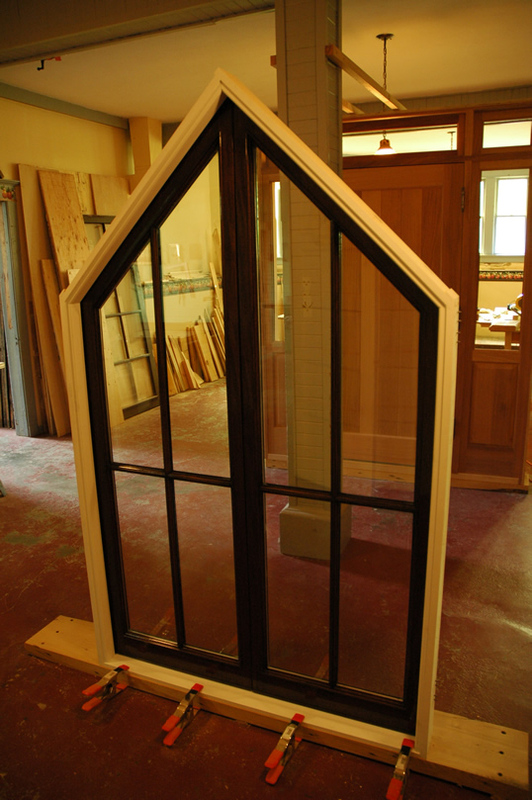 The photo above is a good illustration of a 1-7/8" thick window that will take modern double pane glass. 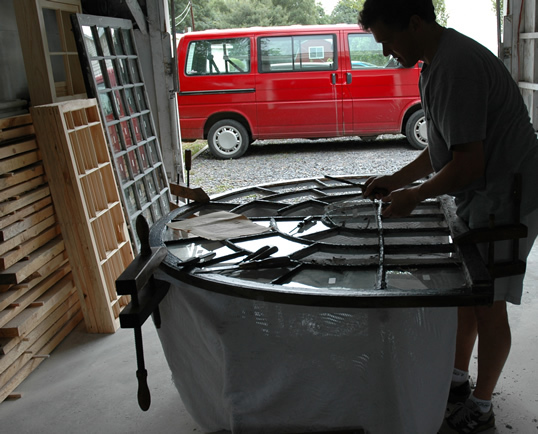 Our customers often request to have the original glass reused. We carefully number, extract and clean each pane of glass and reinstall into the newly created sash. Antique glass with all its imperfections has a delightfully indescribable appearance that has no substitute for those of us passionate about historical architecture. In this photo Kevin carefully removes a lite that is over 200 years old. We built the windows for this gazebo. Wooden windows provide un-paralleled warmth. 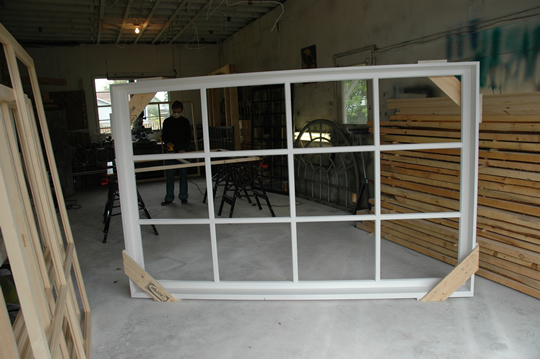 Here is a very large 8' x 5' window that is about to be shipped to Cape Breton, Nova Scotia. We got a special request from a gentleman there who owns an ocean-front property and wanted a large window. One-hundred plus kilometer gusts are quite normal at this location so we built this window with 1-7/8" thick solid maple. 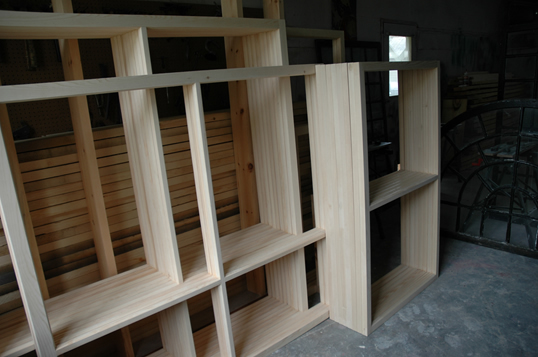 Here we have a load of 24 storm windows ready for glazing. Notice the air vent holes in the bottom rails? We understand that it is the small details which make our products a fit in your home. 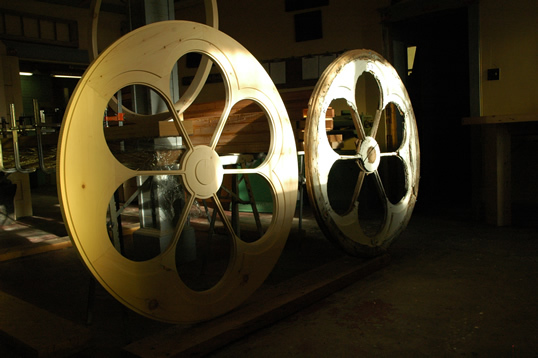 Everything that we ship out is built with the utmost care to ensure historical accuracy. Here we have 16 large sash ready for glazing. 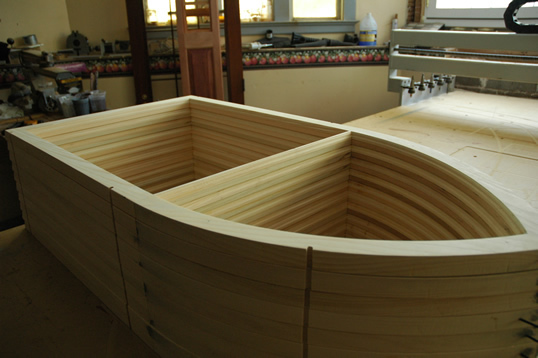 These are going to Mahone Bay, Nova Scotia to be installed in a enclosed pool pavilion. 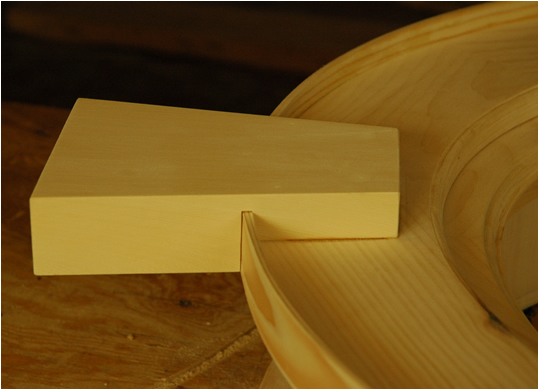 Note the quality of wood we use - straight grained and very few knots.